Glass is the ideal product to use to protect the surface of tables and desks and can be custom cut to fit any shape or style of table or desk top. We have the best glass cutters in the business and make patterns and templates of complex shapes and hole locations, notches and cutouts. We have polishing machines that grind the edges of the glass for a great finished look. Custom edge work is available for those people who desire beveled edgework. Our people will also deliver, set up and clean your glass project, which can come in handy for those extra-large glass table tops. Flower City Glass has mastered the skill of glass table top making and pride ourselves on getting the best fit possible with quality glass cut to perfection. Thick glass can also be used as a table top itself or table support legs. Thicker glass looks more substantial and bold. Clear or tinted glass can be custom cut and finished in almost any size or shape for a one-of-a-kind piece of furniture. Even if you have your own table base, we can provide a top that has the transparent look to compliment your piece. Glass furniture is an unique way to add character and charm to your home that is both functional and affordable! 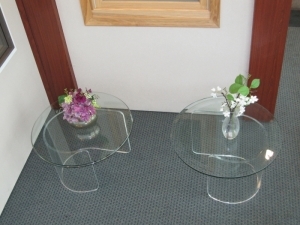 Flower City Glass has always been known for quality glass table tops and desk tops. Why go to a furniture store to buy glass? There is a wide range of design options to choose from such as square, rectangle, round, and oval. Flower City Glass also offers polished and beveled edge work for your piece, plus clear, bronze, gray, and green glass are available. Designing your desk, coffee table, end table, dining room or kitchen table has never been easier. If you don’t have a base for your glass top, you can choose from a huge selection of Lucite, and glass bases. Designs can range from the simple to elaborate, conservative to eccentric, whatever fits your need.